Jocelyn grew up in Chesapeake, VA. She discovered ceramics in 2005 in the mountains of NC near Asheville when she studied under Michael Sherrill. There, she had access to a strong community that helped form her thoughts about working as a craftsperson and artist in clay. For close to two years, Jocelyn worked as a studio assistant for various artists at Penland School of Crafts and spent time working at the Penland Gallery. 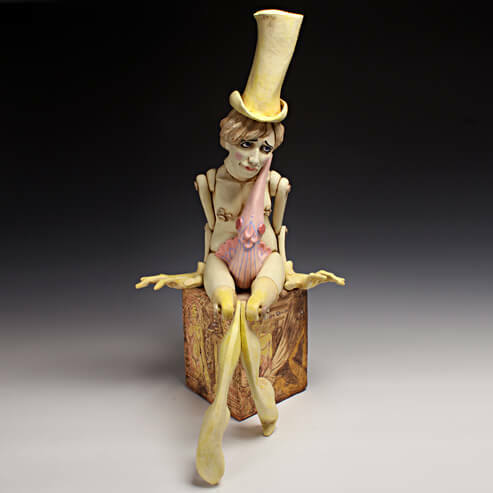 She continued her education by pursuing Post-Baccalaureate work at University of Florida, and recently graduated with her MFA in Ceramics from Edinboro University of Pennsylvania. Her work was recently exhibited in Milwaukee at the NCECA Student Juried Show, and at the Erie Art Museum in Pennsylvania where she received a Juror’s Award from Juror Sergei Isupov. In January, she was invited to participate in the 2014 Ceramic Surface Forum at Arrowmont School of Arts and Crafts. Jocelyn is a former Long-Term Resident Artist at Red Lodge Clay Center. She is currently an Adjunct Professor of Ceramics at North West College in Powell, WY. I use the figure in my work as a vehicle for narratives that involve themes of sexuality, gender identity, religion, adulthood, and play, and I utilize fairy tale whimsy in order to reveal a deeper, sometimes darker struggle. Despite all the cracks and flaws in the human psyche, society teaches us to put on a veneer of adulthood and sophistication. In order to strip that veneer away, I use childhood objects to reveal a more primal nature. I present the figure as mismatched in order to showcase the collection of experiences that create each individual. Each circle of society demands a certain level of conformity, which we either accept or deny. As the result of a cocktail of experiences, we exist in a gray area vacillating back and forth between black and white. We present a carefully curated portion of ourselves to the world, but I seek to expose hidden complexities and struggles. In contrast to the demands of conformity, the internal truths of each person can create a sense of marginalized isolation. In the end, like the circus performer, each figure must either embrace or shrink from the anomalous feeling that comes with confronting their individuality.